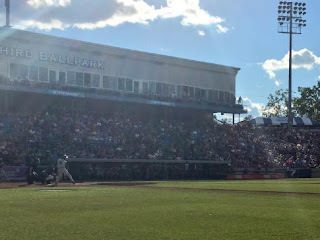 After finding his footing in a season that got off to a slower start than anticipated, West Michigan Whitecaps (50-41) righty Spenser Watkins (3-0, 3.21 ERA) entered Wednesday evening looking to stay perfect against the visiting Peoria Chiefs (54-42). Looking to snap a four-game skid, West Michigan couldn't have asked for much better from their righty in just his seventh start of the year. Watkins took the hill to work a 91-pitch season-high seven innings of work, holding the Chiefs to just one run off four hits and striking out five on the night. After allowing a single and a double to Peoria in the eighth, Watkins bowed out to West Michigan reliever Logan Longwith (0-1, 7.29 ERA). A groundout from Chiefs outfielder Magneuris Sierra would score R.J. Dennard to score the only run for Peoria for the evening, credited to Watkins. Backing Watkins at the plate, the Whitecaps offense was spearheaded by the usual suspects, including a trio of hits and pair of RBI from Midwest League hits leader Will Maddox. Matching pace with Maddox, Whitecaps catcher Franklin Navarro added a three-hit night for West Michigan, including a pair of runs scored in first three-hit outing since 2014. Carrying an eight-run into the seventh inning, it was West Michigan outfielder Cam Gibson that iced the cake, launching a three-run blast to mark his third home run of the season, sealing a 15-hit, 11-run evening for the Whitecaps. In addition to snapping the four-game losing streak for West Michigan, Watkins remains perfect, securing his third win on the year. Coming up next: West Michigan welcomes the Chiefs back for the second of their three-game home series, sending lefty Eudis Idrogo (2-3, 5.87 ERA) to the hill to face Peoria right-hander Juan Perez (3-2, 3.68 ERA).